As the school year winds down in Spain, and the temperatures in Barcelona rise, everyone prepares for the summer vacation. Music exams are furiously studied for and students practice for the annual music concert which takes place at the end of the year. It’s an exciting occasion and one that the Estudio Shine family look forward to each year. Students invite friends and family to come and enjoy all the musical pieces and the day is filled with a fun musical energy. Each year some of our teachers perform too, in an anticipated Finale! This year the school will be holding it’s concert once again in the wonderful bar of the Lluire Theatre in Gracia. Those that would like to, join in for an informal lunch between the two sections of the concert, the beginners and the advanced students who perform in the afternoon. We will be opening the concert doors this Saturday the 18th of June, and invite you all to come to the bar, enjoy a drink or coffee while you listen to some wonderful music, performed by talented students, both young and old! We have performances on the piano, guitar, ukulele, accordion, saxophone, clarinet, and more! 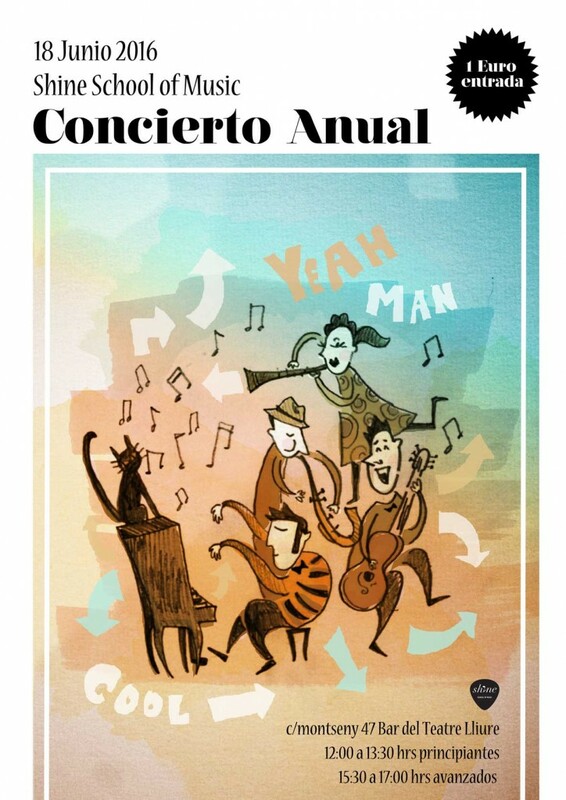 It’s sure to be a great musical event in Barcelona!